Clare Harding. All rights reserved. Jean Shirlaw has sent in this story, with the help of her niece Clare Harding (nee Stein) who now lives in the south of England. Clare’s father, James Stein was born in Beechwood Cottage, Addiewell in 1922. 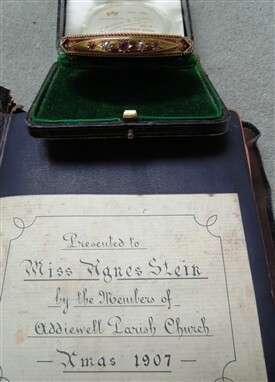 ‘On Thursday evening of last week, in Addiewell parish Church, Miss Scott, organist, was made the recipient of a very handsome gold bangle, set with rubies and diamonds, and with a a book of music, in recognition of valuable services rendered to the church during the past three years. Mr Maxwell replied on behalf of Miss Scott. Clare’s grandfather John Stein was born in 16 Stephenson Street, and later lived in Beechwood Cottage from 1921-32. Four generations of her family worked for Young’s and lived in Addiewell, starting with her great-great-great-grandfather John Stein, who lived at 2 Faraday Place with his daughter Agnes. Agnes Meek Stein was born in 1864 in Whitburn, and came to live at 2 Faraday Place, Addiewell, when her father started working as a Foreman Engineer at the retorts of Young's Paraffin Light and Mineral Oil Company. She attended Addiewell Public School where she was a Pupil Teacher from 1877-1882. 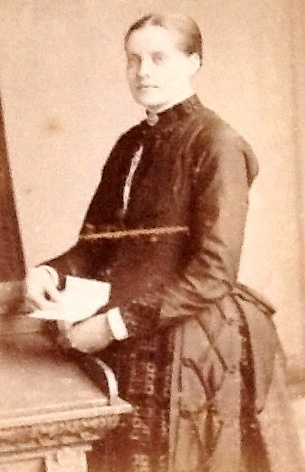 She left in 1883 to study at the Free Church Training College in Edinburgh, where her skill in teaching was reported as VG and her sewing and cutting out was Excellent. The Free Church Training College was united with the Church of Scotland training college to become the Moray House Training College as it’s known today. Agnes left the College in 1885 and was appointed an assistant at East Pittenweem Public School in March 1885, starting her duties on April 10th on a salary of £55 per annum. While there, she obtained her parchment certificate in August 1887. The photograph shows her holding the certificate - she would be 23 years old. On 18 November 1887 she was appointed to Armadale Public School, and left Pittenweem School in December. Armadale school records are missing so it’s not known when she left there to go to West Calder Public School. From West Calder School, she went on to Addiewell Public School where she started work in June 1901. On 20 January 1911 the school records note that Miss Stein sent in her resignation on account of ill health. At this time both Agnes and her mother were ill; her mother died on 9 May and Agnes died a month later on 13 June 1911. This page was added by Sybil Cavanagh on 06/03/2013.